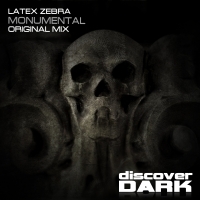 Latex Zebra returns to Discover, flexing his dark audio tendancies with the fierce Monumental. Based around a driving bass set against acidic undertones and a melancholic chord stab, Monumental puts its foot down in the break with a fierce driving hit that pulls in all the elements of the build in uncompromising style. A proper journey of a tune. Original and uncompromising - just how we like it. 'Monumental' is available now from Beatport and iTunes.